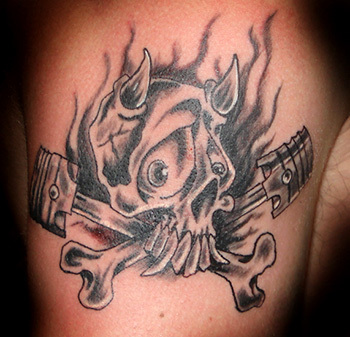 One of the most popular tattoo designs are skulls. Beyond the design, they serve different meaningful purposes depending on the person who’s planning on having it, with death and mortality as the most common symbolic meaning. 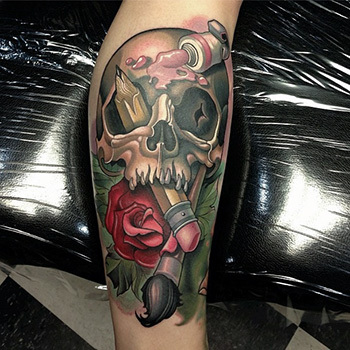 Other tattoo enthusiasts interpret skulls as a symbol of protection, past life or reincarnation, power, brute strength, surpassing a difficult time, or a second life on earth. In fact, old wisdom would tell you that tattoo meant “great change” in life or anything that’s considered as a transformative experience. People commonly see skulls as gothic, dark and bizarre. It became synonymous with evil, even. But this kind of connotation only suggests that skulls are for people who can stand up for its meaning; that they are as tough as “death” for simply overcoming a major setback in life, for instance. And for certain people who prefer to have a skull inked on their bodies have a reason behind it. So, if you’re planning on having it, might as well be find a strong reason so you can feel passionate about having a skull inked on your body. This tattoo design is inspired by the Day of the Dead of Mexico. It’s similar to All Soul’s Day across different cultures that is annually celebrated every 1st and 2nd of November. 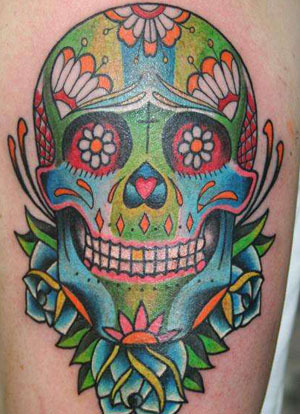 Sugar skull tattoo is typically designed with calacas or masks and sugar skulls. In Mexican culture, some people get this type of skull tattoo in an effort to celebrate the Day of the Dead as well as to express their sympathy towards dead people and the family they left behind. 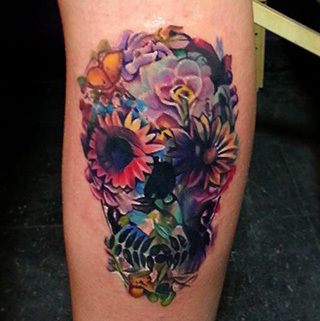 This one is increasingly becoming popular as more and more women desire to have a skull tattoo. It can be drawn as demonic spirits but with added details that look feminine such as ribbons, pink and purple colors, heart symbols for the eye sockets instead of using the traditional hallow hole. Also, girly skull tattoos tend to have smooth edges compared to the masculine ones with rough edges. These are the so-called old school designs that were so popular back in the day. And because it’s a primary tattoo, lots of tattoo artists have mastery of tattooing this on one’s skin. In fact, some of them have old school tattoos as their area of specialization. This type of tattoo is often characterized by its simple and dark-bold outlines. Apparently, this one looks as colorful as a rainbow. Tattoos nowadays are decorated with different symbols and things that are relevant to the life experiences of the person who’s having it. So, the meaning of a decorated skull tattoo will vary. One detail could lead to another meaning but if these details are taken into general interpretation, a decorated skull tattoo surrounded by flowers can mean infinity. Since tattoo artists enjoy the privileges of freedom of expression, some skull tattoos are now adorned with details that were once impossible of having before such as a winged-skull, a skull with a body and wings of a butterfly, etc. Tattoo artists can draw inspiration from the preferred theme, subject matter and motif of an individual, or by expanding their imagination beyond the physical borders of this planet exploring all the possibilities like something magical. Skull tattoos can be drawn as girly doodles with matching floral designs, demonic-inspired, playful celebrations and decorative. Sure you find them awesome but they’d look more brilliant if placed at the right part of your body. This is one of the important things that you should consider before having one. Ask yourself whether you want it in an area exposed to people or somewhere you can easily cover with the sleeves of your shirt. 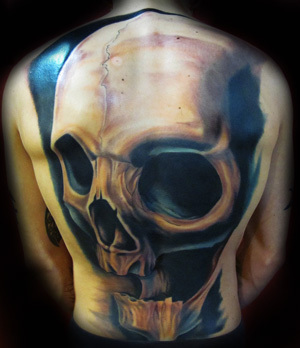 Skull tattoos are normally placed in the shoulder, back, arm, neck, finger, foot, and leg. Although having a tattoo is entirely up to you, some employers do not allow such an interest in the workplace, so you either place it somewhere hidden or have none of it all. 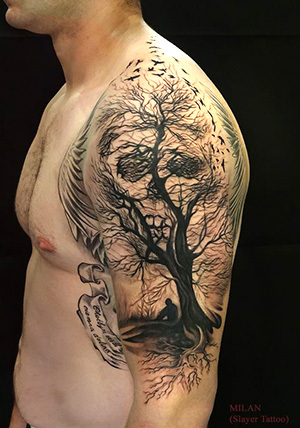 Once you have decided to go for it, it is about time to search for a tattoo artist that specializes in that specific skull tattoo that you are interested in having. You do not want your first or succeeding skull tattoos look like a mess because the artist failed to capture the message that you’d like to convey. A specialist can help you bring out the best in your skull tattoo by executing a design that is as stunning and concise as you want it to be. Also, be careful in choosing the specific colors that should match the design of your skull tattoo. Adding colors and details will add life and deeper meaning to the tattoo besides making it more visually appealing. Simply choose colors with meanings that resonate with you. Skull tattoos convey strong meaning, and it is only appropriate to have one if you can relate to it deeply. You can ask an artist to custom made a design for you so that in one tattoo, you will be able to summarize a significant event in your life.